Heat gas or charcoal grill. In medium bowl, mix all patty melt ingredients except bread and cheese. Shape mixture into 4 patties, about 3/4 inch thick. Refrigerate while cooking onions. In 8-inch skillet, heat oil over medium-high heat. Cook onions in oil, stirring frequently, until tender. Stir in salt and pepper; keep warm. Place patties on grill rack over medium heat. Cover grill; cook 12 to 15 minutes, turning once, until meat thermometer inserted in center of patties reads 160°F. Add bread slices to side of grill for last 5 minutes of grilling, turning once, until lightly toasted. Top patties with cheese. Cover grill; cook about 1 minute longer or until cheese is melted. 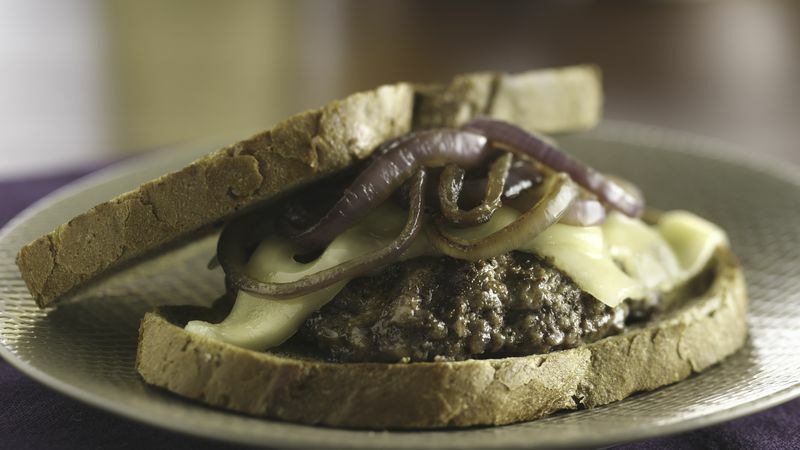 Place patties on bread; top with onions. If grilling turkey patties, brush the grill rack with oil before adding the patties. Because of their lower fat content, turkey patties may stick to the grill otherwise.